"Use this chart to help you find Comet 252P/LINEAR at least 1.5 hours before sunrise in late March. The area of sky shown is close to the southern horizon for observers at mid-northern latitudes. Symbols show the comet's location every 8 hours along its track; those with dates are plotted for 4 a.m. EDT (0800 GMT) on that date. The comet will likely appear as a soft, round glow with a bright center and [no] tail. The 10-degree scale bar at the far left is about the width of your clenched fist at arm's length, and the faintest stars shown are magnitude 5.5 (visible from a dark site free of light pollution)." From Sky & Telescope. LINEAR passed its closest point to Earth on March 21, at a distance of about 3.3 million miles (5.3 million kilometers). Given that it's now moving farther out into the solar system and away from the sun, astronomers aren't sure how long it will stay this bright. Observers with very large telescopes also may be able to spot another comet passing near Earth: Comet Pan-STARRS (designated P/2016 BA14). It came within 2.2 million miles (3.5 million kilometers) of Earth on March 22. "The timing of these paired visits is probably no coincidence," said the same statement from Sky & Telescope. "The 'P' in both comets' designations means they are in periodic (elliptical) orbits that bring them near the sun repeatedly — in this case, about every five years. Their orbits are so similar that comet specialists suspect these two bodies are fragments of a single object." Comet LINEAR was discovered on April 7, 2000, by researchers from the Lincoln Near Earth Asteroid Research program (an MIT Lincoln Laboratory program funded by NASA and the U.S. Air Force). The comet's core is estimated to be 750 feet (230 meters) across, according to the statement. Comet Pan-STARRS was discovered by researchers from the Panoramic Survey Telescope & Rapid Response System (University of Hawaii) more recently, on Jan. 22, 2016. Its core is estimated to be 350 feet (100 m) across, according to Sky and Telescope. 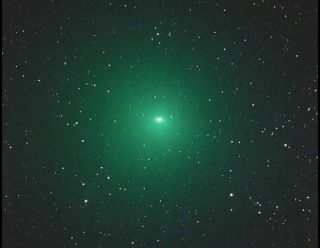 Editor's Note: If you snap an amazing picture of Comet LINEAR, you can send photos, comments and your name and location to managing editor Tariq Malik at spacephotos@space.com.